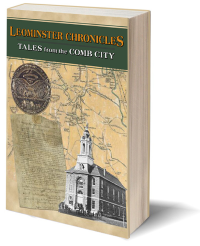 In forty-two fascinating stories and more than eighty photos, Leominster Chronicles, captures the people, places and events that have made the City of Leominster, Massachusetts a special place. Enter the name for the autographed hardcover book dedication here. Officially incorporated on July 4, 1740, today Leominster is Worcester County’s second largest city with a population of more than 40,000. Since it’s founding, Leominster has been home to many colorful and important historic figures. From abolitionist Frances Drake to John Chapman, better known as Johnny Appleseed and dime-store novelist Buckskin Sam, Leominster citizens have been dreamers and doers. Leominster’s industries revolutionized the American landscape. From a fledgling comb industry, Leominster’s plastic pioneers helped change humankind and earn the city it’s nicknames, “Comb City” and the “Plastic Capital.